All the attention right now is on the 2017 Samsung Gear 360, but there’s a less known 360 camera that may actually be better, for about the same price — the Xiaomi Mi Sphere 360 camera. In this post, I compare photos and videos from the two cameras, as well as describe the workflow for the Xiaomi to help you decide if the Xiaomi is better for your needs. UPDATE: Here is a full review of the Xiaomi, with updated features, including stabilization. Here are sample photos from the Xiaomi, including a comparison photo with the 2017 Gear 360. 1. The Xiaomi has much more detail. This is not surprising because the Xiaomi’s photo resolution is significantly higher (6912 x 3456) compared to the Gear 360 (5472 x 2736). 2. In shadow areas, the Xiaomi has an even bigger advantage. The Xiaomi retains detail in shadow areas, whereas the Gear 360 has much less detail in the shadows. The Gear 360 also has much more noticeable chroma noise in shadows. 3. The Xiaomi has almost edge to edge sharpness, losing sharpness only very close to the stitch line. The 2017 Gear 360 is noticably less sharp over a wider area near the stitch line. 4. Both have good stitching, although the Xiaomi is prone to slight doubling, while the Gear 360 is prone to slight smearing. 5. Both have purple fringing, although it’s much more noticeable with the Xiaomi. Overall, I would say the Xiaomi has noticeably better photo quality than the 2017 Gear 360. Furthermore, the Xiaomi has manual exposure control. You can also use ISO priority by specifying the ISO and then leaving the shutter speed on Auto, or vice-versa to use shutter priority. Finally, the Xiaomi’s shutter speed is as slow as 32 seconds, which should be sufficient for night sky photos. 1. 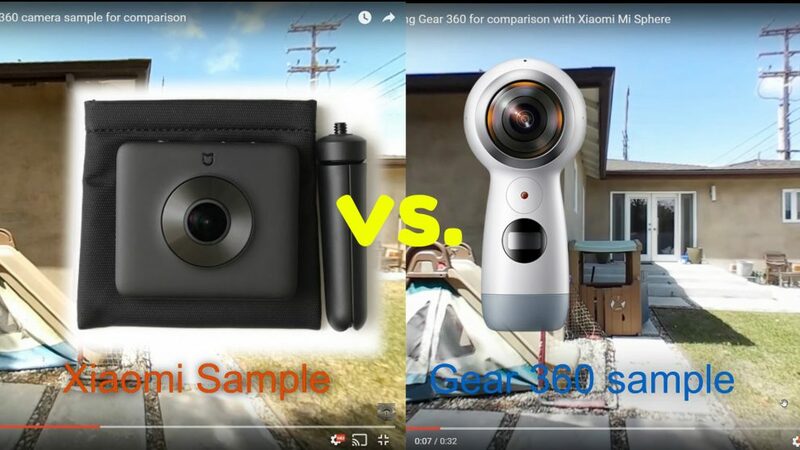 Surprisingly, even though the Gear 360 has a higher nominal resolution, the Xiaomi has at least the same level of detail as the 2017 Gear 360, and it might even seem slightly sharper. 2. For shadow areas, the Xiaomi has far more detail than the Gear 360, again notwithstanding the Gear 360’s higher nominal resolution. 3. 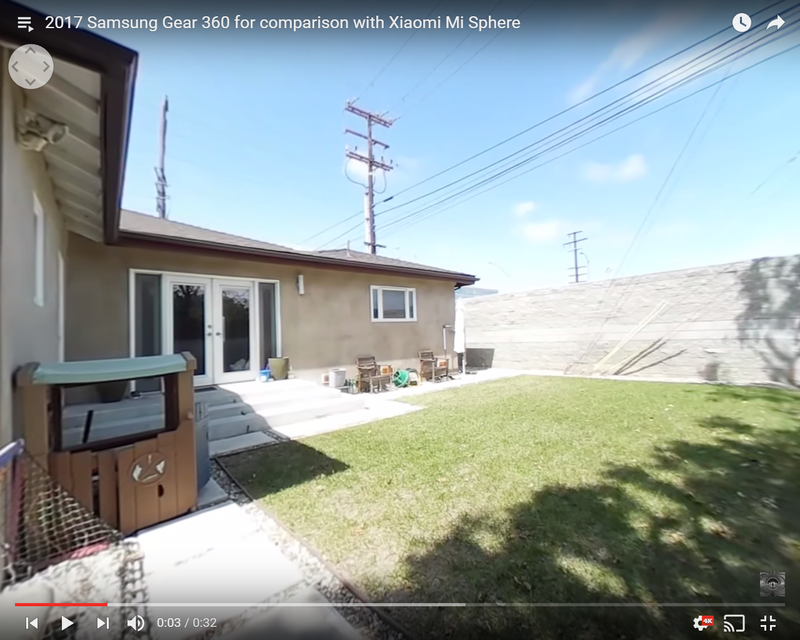 The stitching for video looks smoother for both cameras, although the Gear 360 has some warping whenever something crosses the stitch line near the camera. 5/31/17 Update: it’s now easier. Viewing and sharing photos on the Xiaomi is straightforward. Photos are unstitched in the memory card, then stitched in the app. There’s an app for both iOS and Android. When you view the photos in the app, the app stitches them and downloads them to your phone at the same time. On Android, they will be in your Gallery, ready to share. On iOS, you need to tap on the photo, select the three dots, then click on Export to create a copy in your Camera Roll. Note: There is no desktop software at this time. 2. On the bottom, tap on the 3 dots. 3. Tap on the option with the arrow pointing up. This will export and stitch the video to your camera roll. If the video is not exporting, your phone is not powerful enough — see option 2. 4. Go to your phone’s DCIM\MadV360 directory. 5. Upload to your preferred sharing site. It should have 360 metadata, but if the metadata is corrupted, you can insert 360 metadata with the YouTube metadata injector or with VRFix or with a video editor such as Collect 360 or V360. Xiaomi Mi Sphere is available from GearBest here, which would support 360 Rumors at no additional cost to you. Thank you very much! If you don’t need the live streaming, consider buying the 2016 Gear 360. eBay Germany is flooded with these cameras now because Samsung is bundling them with their popular phones and many people don’t seem to be interested. This means you can easily get a shrink wrapped Gear 360 for less than 100€. How does the Xaiomi compare to the original Gear 360 which has higher res stills and better edge resolution? Just double checking, exporting gyro stabilized videos does work in iOS? Thanks for taking so much time to show the difference between both cameras. I’m tempted by the Xiaomi but video quality is still very poor compared to what you can get from a solo camera. I read that compression in YouTube has a negative effect on this but also the software you use for the stitching. I was wondering if you can access raw (= untouched, not stitched) video and photo files from the camera and if yes, do you see the same loss in quality? Can anyone tell me what Micro SD 90mb write speed cards work with the Xiaomi Mi Sphere 360 camera? I want to record in 4k video. hey mic… love your site. thanks for the effort to inform and educate. i’m curious about your thoughts on the landscape hdr feature of the 2017 gear 360.
in my opinion, it’s the best feature of the camera. though one would expect to have to use a tripod, i have had great results holding a monopod very still. Well, so do you recommend sell my gear 360 (2016) and BUY a Mi sphere? Thanks Ramon! 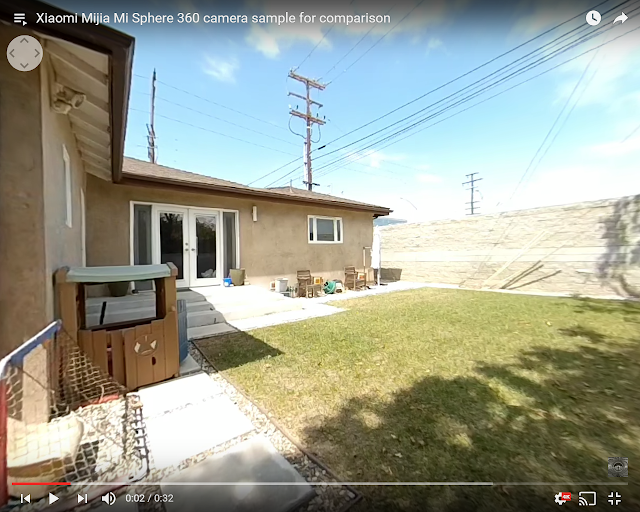 A Mi Sphere is definitely much better than the original Gear 360, except maybe for photos they are about equal (other than the Gear 360’s glare). But you probably should wait at least for the insta360 announcement tomorrow (check back here on 360 rumors). And in addition, the Yi 360 VR, Theta 4K are coming out soon. I will be reviewing them all. As for whether to sell the old Gear 360, right now the price of a new one is very low, so the resale price is even lower. It’s so low that you probably should just keep it — it’s more useful as a second camera, imho.